The work continues for Scappoose High's girls basketball team. Going into this week's North Marion Tournament, the Indians were 0-4 and coming off a 55-20 homecourt loss last Friday to Seaside. "What I love about our group is there's no question about their effort — it's 100 percent," Scappoose coach Sarah Mann says. "They don't give up. They don't play the score. We've just got to do the little things better and keep working on our execution." Getting the ball up the court and then running an effective offense continued to be Scappoose's issues in the game against the Seagulls. Both teams struggled with their ballhandling in the first quarter. Scappoose had nine turnovers in the opening eight minutes, and Seaside committed seven. But the Seagulls got better throughout the night at spacing the floor in the half-court and making good angle passes to open shooters. Seaside wound up knocking down seven 3-point shots and battled well enough to earn 23 free throws, sinking nine. Eleven Seagulls scored, with senior guard Emy Kiser netting a team-high 14 points. The teams were tied 4-4, thanks in part to a couple of early steals by senior guard Sarah Mills, before Seaside went on a 14-0 run. It began with 1:23 left in the first quarter and continued the first 4 1/2 minutes of the second quarter. With its third win in a row, Seaside raised its record to 4-2. "We played pretty well," coach Mike Hawes said. "We came out a little flat, fumbling around, but once we figured out what we were doing, we did a nice job of moving the ball." Hawes liked the impact his team's backcourt pressure had, too. "Obviously, Scappoose is a team you can pressure a little bit, so that worked to our advantage," he said. "They struggle a little bit against the full-court pressure, and that gave us some opportunities." All in all, "it was a good win for us. We're still trying to figure everything out. But we got to play everyone, and a lot of people scored." For Scappoose, senior post Gaby Dague finished with eight points, making a pair of field goals and four free throws. But for much of the night, Scappoose had trouble working the ball for a good look or open attempt. Junior post Emily Kopra nailed a 16-foot jumper in the first quarter to tie the game at 4-4, but that was the only outside shot made by the Indians, who were outscored 13-0 in the third quarter. "Our whole squad was really disappointed, and I was disappointed with our execution and press break," Mann says. "That and not being able to finish in the paint. A lot of it comes down to focus — we do finishing drills in practice against contact, but at this point it's a matter of getting more reps.
"Early in the season, it's hard because you're trying to install systems. But our offensive game has had a challenge trying to get more points on the board. "And rebounding continues to be a struggle. We don't get a lot of offensive boards, and we haven't been clearing the boards." The morning after the Seaside game, "I was up at 6:30, looking at film, trying to identify our weaknesses and coming up with ways to break old habits and create new ones. "It's important that we get a little bit better every time we step on the floor." 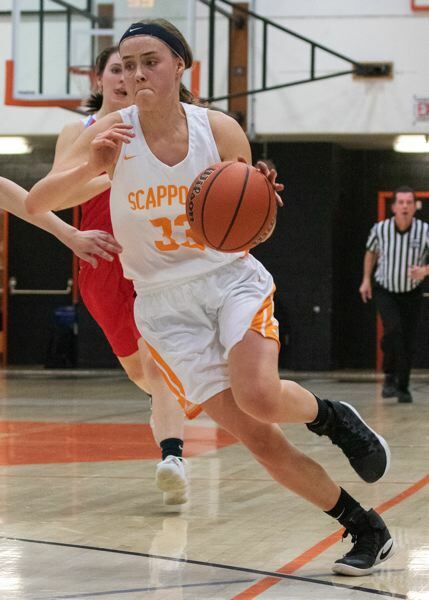 Scappoose was slated to play three games this week, Thursday through Saturday, in the North Marion tourney, starting with a Thursday meeting with Tillamook. One highlight last week came just before the varsity game: The Scappoose JV beat Seaside 44-19, raising its record to 2-2. "That was a big win," Mann says. "Their defense was outstanding, and they finished in transition. "Our younger crew is super. They're coachable, and they were in the gym in the offseason. Having a ball in your hand at some point between seasons is important. They're not having to install those fundamental things during the season."